After reading posts from several Singaporean stock bloggers, I am happy and impressed that there are so many clever and selfless people here. These bloggers put in so much effort in sharing their valuable knowledge and experiences. I also realize that most centered around stocks and financial freedom. Apparently quite a few were inspire by Robert Kiyosaki "Rich Dad Poor Dad", though not mine idol, there are many good things to learn from him. For my blog, aside from stocks as passive income growth, I think Income Growth and Real Estate investments are even more important. After graduation, I was hit with S$40k debts from loans in uni. I struggled with a 2k monthly salary during SARs crisis, meaning 1.6k take back pay, with >600 goes to loan each month leaving with less than 1k. I begin to focus on growing my Career and giving more Tuition for extra income. I work very hard and learn as much as I could, while exploring different roles to have more experiences early. I started with on site hands-on dirty and tough work which most graduates do not want to do. After that, I make role switch to project and subsequently to sales. Within 7 years, my fix salary grew more than 5x, excl. bonus and some shares options. "Lots of Hard Work! Add Value to the Company! Ownership! To me, People are just like stocks. If your Net Asset Value is rising, it is a good stock to keep. If it is depreciating, it is time to divest. It is very important to learn as much as possible for fresh graduates. Learn to handle stress and endure hardships. Your income will grow once you excel in what you do, and add value to your company or business. It normally takes at least 7 years in the same field to achieve considerable success, but if you are faster learner and work harder, it can be shorten to 5 years. I ask myself if I were able to turn back clock, what will I do? Below are my answers. Learn investment for passive income/compound return as early as possible. Make plans to start your own business while in school. Get a job related to your business plan and learn as much as you can for next 5 yrs. Meanwhile advance your business plan by doing something part time. Once you are ready, preferably by 30 yrs old, quit your job and focus on your business. Why is it so important to have income growth? Consider income of 2 households at age 30. 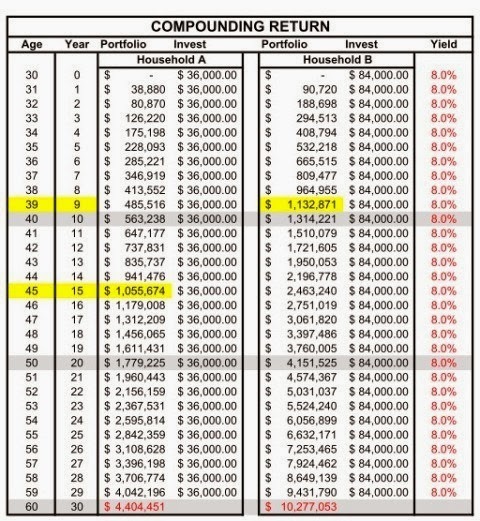 Consider ave Yield 8%, it will takes Household A-15 yrs Vs Household B-8 to 9 yrs to achieve a 1M portfolio. By age 50 yrs old, Household A will have 1.8M Vs Household B > 4M. By age 60 yrs old, Household A will have 4.4M Vs Household B > 10M. Investing in Property is essential in land scarce Singapore. For average Singaporeans starting from small stock portfolio, the return can never be as fast as Property. This is due to the leveraging effect of property. As long as you are still young, plan your expenses carefully, do your research, have the mindset of continuing working, I think it is worth considering buying a higher price property that has a potential of higher growth in future. This of course have to come from the earlier point that you already achieve Income Growth capability where accumulation of wealth is much faster for you to invest in Real Estates. I had seen many of my friends waiting for prices to drop in past years. It never happen, many ended up buying at more expensive price. Those who bought earlier reap all the benefits of buying at low price with no stringent property rules. E.g a friend of mine who bought his 4-room HDB in 2008 at 200k with few grand of COV. He had finished paying his house loan and is renting at > 2k per month now. He is staying in a private property now. His salary over years then are quite comparable to most other friends. Some of whom are still waiting for the right time to buy a property. You have to be Quick and Sharp. Once Ready, Do not wait! Me and my wife currently own 2 properties, one 4-room HDB near MRT at central region and one private properties. We are renting the HDB with fix monthly income which is way more than the dividends of a let's say 200k stock portfolio. This excludes the capital growth of the house. For the private property purchase few years back, we selected one that is expected to have MRT station nearby in five years down the road. The value had since rise more than 30%. I paid 200k down payment excl stamp duties, legal fees etc for a 1M condo. Current value is conservatively at 1.3M. For 3 yrs period, it means >300k return. i.e. 100k a year! I doubt I can get such return if I invested my 200k downpayment into stock 3 years ago. Nevertheless I did set aside quite a substantial sum of money in stocks then. This is to achieve a balance and diversify portfolio. Read a few property investment books, before your first purchase of property. Start early for the purchase, do not wait if this is your first time looking for a house to stay. Better to apply for an HDB flat in your first purchase to achieve the benefit and low prices granted by government. View at least 10 flats on site and at least 100 on advertisements. Require to have back Cash or CPF in OA for at least 12 months in case you stop working to repay housing loan. Better to pay slightly more for HDB/99 year leasehold near MRT station if you have the intention to rent it out one day. Spot for property with future upcoming MRT station. Buy freehold property if you have intention of selling one day, say after 10 years, since value virtually do not depreciate compare to 99 year leasehold property. You need set aside at least 12 months of expenses in cash or liquid form in case you stop working. Depending on age and experience as a factor to determine how fast you can find a job, you may require more. I already have back up expenses of 12 months or more plus 6 months job notice period in case I stop working. This add up to 18 months safe zone period in case I stop working. But as long as you are "Asset > Liability" for the company, I am quite sure you will not be made redundant. Even you are unlucky and make redundant, I am sure you are able to get a job within the next 12 months if you are eager in your search. To end this post, I suggest my children or any interested reader on following. Learn financial planning such as savings, insurance and investment when young. Learn what is business and how to analyse it even before graduating from school. 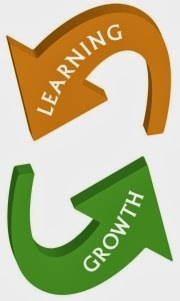 Go to a company that allows you to learn more and not earn more when young. Focus more time and energy in Income Growth by adding value to your company or businesses. True experiences and knowledge of business is more valuable than reading from books. Once you acquire these skills, your income will grow indefinitely. With more income, means more investments inject to your Stock or Real Estates Investment Portfolio. It will compound much faster. In my blog, success is not base upon how early you achieve financial freedom nor how much you have earn this year. It is about living a balance life to its fullest. It is about setting up and managing of family and relationship. It is more difficult than managing your portfolio at times. It is about getting job/business satisfaction, passion in things you do, finding hobbies, experiencing the world. It is about friends and relatives. It is about failure and how you bounce back stronger and more intelligently. Sometimes opportunity comes in an instant and we can't do anything about it. But in our part, for our real estate we shall be ready as always to keep it stable. Now, focus more on every plan that we make to keep a stable business running. In Singapore, most people will feel that they have already made it when they own 2 properties since they can now fully take advantage of the property cycle (buy low, sell high) and achieve some passive income (rental). I am actually quite apprehensive of this strategy since in most cases, >80% or even 90% of the net-worth will be in Singapore properties. Guess it’s about balance and knowing best about yourself. What applies to me, may not apply to others. I read and noted that most investment blogger is not favouring property over stocks, because in the rule of investment, you must be risk averse and try not to leverage as much as possible. I also know that most property investor does not favour stocks and think it is risky. It is chicken and egg! Guess there is no right and no wrong, if we did it right!. I am sure there are more debates/disagreement if he is not “Peter Lynch”. For me, I try to balance and have an open mind and find the way that best fit me. So far over the years, it works for me and I am happy. It works “NOT” necessary equal to Correct! Actually I have many views regarding how to make a property work for me, but I guess I will only share if I meet people of same “view”. Otherwise it is a never-ending debate if two persons of opposite views engaged in a debate. Debate healthy initially but can be lengthy and eventually unhealthy and unhappy. I reckon both property and stocks are equally important. As much as property like stocks, you must know what you are doing and buying. We probably should not focus on what people feel when they had two properties! That is irrelevant and will distract our focus! I try to focus on how I can make it work. For me, I prefer to have a strong portfolio as well as properties to balance it. I oppose to having property as >80-90% of my portfolio just like you, especially when you are like me having family and kids, and so many expenses. It can be very dangerous. Hence property is just a part of my portfolio of stocks and cash. Again find what it work best for you, and please do not focus on others too much. If you read the purpose of this blog, the audience of most important is for my children. For my reader, I always advocate to focus on the facts and not my views. Last but not least, I really appreciate your comments and yes, my kids will read about it one day and they may think just like you and comment on my article constructively. Haha…. In fact, I am starting to appreciate that everyone is more "different" than "same" sometimes and it's more important to find what works than what is supposedly the "best". I rarely prospect a company deeply and most of the time, it's top down simple analysis rather than bottom up. Many would probably advocate that I buy an index instead as what I am doing can be considered quite "risky". But so far it has worked pretty well for me. I agree that we are all different but same! Yes, being different is a fact, but the most difficult task is to accept the differences! Jim Rogers urged her daughter to understand the world by being there and accept differences of people and be a world citizen. "World peace! - haha"
Warren Buffett never buy tech stocks - it works for him. On the contrary, people who buy tech stocks and profit from it are not wrong either because it works for them. Aside from analysis, I also focus a lot on the management. It is not easy because we do not know them. I try to use my "people sensitivity" and gut feel skills to evaluate. It can only base on my experiences dealing with people across globe. Fingers cross if they are right? Haha..
Amazing business project and this article tell me how start your business and how to advertisement to your products in public with easy way thanks for share it mba capstone project ideas .